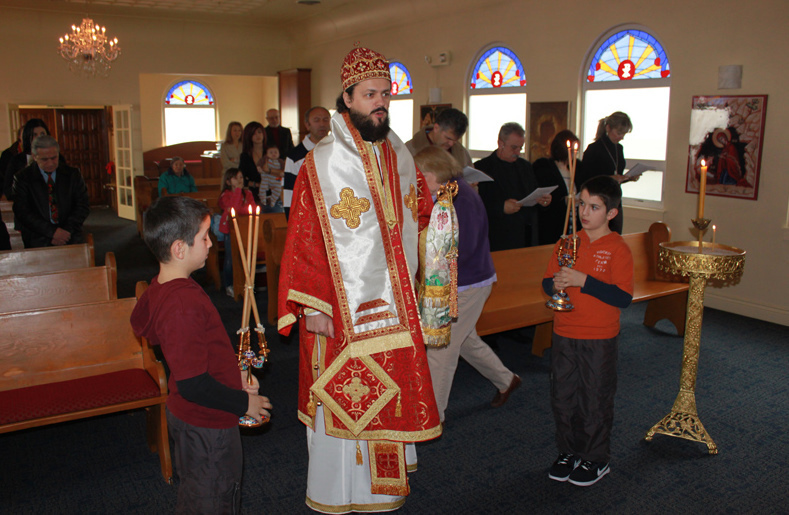 Boise, Idaho - On Saturday, January 15, the Serbian Community in Boise, Idaho, received for the third time in two years its Bishop and had the Liturgical celebration. His Grace, Bishop Maxim visited this Serbian Community with Rev. Presbyter Fr. Predrag Bojovic. The Hierarchical Divine Liturgy started at 10.00 am, and some 60 people actively attended and participated in this Eucharistic event. Following the Holy Liturgy, there was a lunch. The host of the Greek Orthodox Parish of Saint Constantine and Helen, Fr. Nektarije Serfes, was extremely hospitable. He invited the Serbian Community to join his parish and participate in the sacramental life of the Church. The faithful were overjoyed with the bishop's archpastoral visit which encouraged them to have a more active church life in their city of Boise. Fr. Nektarios Serfes, a great friend of the Serbian people, spoke about the need in Kosovo and Metohija and called upon the Serbian faithful to attend the services more frequently.